The golden era of the Victorian Glasshouse saw increasingly grand architectural buildings, built to propagate and display plants from around the world – designed to maximise light and create the perfect temperature for the exotic varieties inside. As the interest in all things botanical continued, buildings became simpler and those with smaller spaces could now cultivate plants and grow food for home consumption. This evolution to lighter, functional, self-assembly glasshouses provided the inspiration for our range of Victorian Greenhouses today. Spring has finally arrived and gardeners will be looking to get back outside and into their greenhouses. But for those that have keen interest in growing their own fruit and vegetables but are perhaps more limited on space, Forest Garden has the ideal solution. Designed to be positioned in an open part of the garden or against a wall or fence, this greenhouse is ideal for gardens which are restricted for space or access. It comes with four opening doors, cleverly these doors can be hung in any position, depending on what access is required, giving complete flexibility. Gardeners will really appreciate the amount of growing space inside. There’s room for two grow bag trays on the floor and slatted staging, which can be slotted in and out as required. The Victorian Walkaround Greenhouse can be reorganised to accommodate a range of differently sized plants. The roof of the greenhouse has two windows which can be opened manually to regulate temperature, but gardeners can also upgrade and have an auto vent fitted to control one of the windows automatically. The Victorian Walkaround Greenhouse is made from smooth-planed timber, which gives it a natural finish. 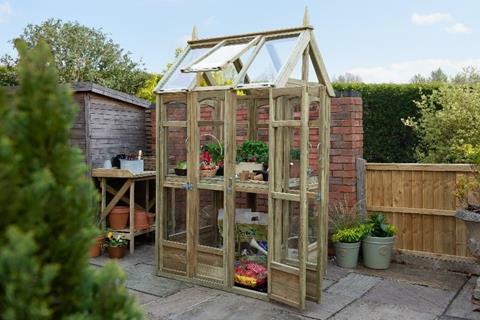 For those gardeners wanting to customise their greenhouse the structure can be painted once purchased – the acrylic glazed windows come with a protective film on them which means messy painting isn’t a problem – simply paint the framework, assemble using the easy to follow instructions and then peel the film off. The greenhouse is pressure treated giving it a 15-year guarantee against rot and fungal decay. All Forest Garden products are available nationwide from high street multiples, garden centres and online.